The team came to the Shanghai International Raceway off the back of a strong yet unfruitful trip at Suzuka. Tom had raced well last year at the same event and the team started out looking for the correct set up for the car from FP0. The circuit has two fast sectors in One and Three and a more technical Second sector. Getting the balance correct to allow Tom to attack the kerbs and be stable under braking would be vital. Getting a tow down the two long straights would also be key to getting a good qualification time. In FP 1 it was clear that Tom had the speed in the fast sectors as he posted the third quickest Sector 3 time. The team realised what was needed to be done to make the car handle better in the Second sector and adjustments were made. In FP2 Tom went out and immediately improved his time posting a 1:57:251. This still put him P17 but less than ½ second separated the next 10 places. Qualification and Tom went out and set a lap of 1:55:817. He then came in for a new set of tyres and looked to try and get a tow. He went back out for another hot lap and improved yet again. This time he posted a 1:55:610. He could not find a car though to provide the vital tow down the straights and in another very close session he would qualify in 19th. This was less than 300th of a second of Q2 time. Race day and the conditions were overcast. As the race approached the sky darkened and drops of rain started to fall from the sky. Teams scrambled to prepare a wet set up and as Tom waited in the pit lane the race was declared a Wet Race and reduced to 10 laps. Tom went out on slicks still and the decision to go to wets would be made on the grid. Assessing the situation the team decided to keep on slicks as other teams around went for Wets. The race started under the safety car and Tom was down in 19th following Darryl O’Young. Darryl let a gap open up in front of him so the cars behind had more to make up. Tom quickly passed him and started to chase down the rest of the pack. He posted the quickest sector 1 time then the quickest sector 3 time. On lap 6 he posted a 2:05:914 which was the fastest lap of the race at that point. He was now in P14 and chasing the BMW of Tom Coronel. He past him on the straight then chased down and went past the SEAT of Marc Basseng. Tom was flying. On lap 9 he over took the Chevrolet of Rydell then in a great move on the final lap past the Honda of Monteiro. In doing so he also posted the fastest sector one of the race. He was now in tenth and on the last corner into the final straight he powered past Norbert Michelisz in the Honda to finish P9 overall and P3 independent. Championship points had been scored and the first podium of the season gained in a great race for Tom and the team. With only five Minutes before the start of the repair time, the team had to refocus again quickly and Tom looked for a repeat performance. This time it would be from a standing start and the track was still wet. Tom was also starting from the damper side of the track. He made a clean start though and didn’t lose any places as the pack went through Sector One. Down the straight on Sector three though Tom made his move and passed James Thompson in the Lada and Bennani in his BMW. He was now up to P17 and again found himself chasing the Chevrolet of Rydell. On lap 4 he past the Swede and Franz Engstler to move to P15. Following Alex Macdowell they both went past Valente as Tom moved to P14. On lap 7 Darryl O’Young locked up into the back of Freddy Barth and Macdowell also got held up in the incident. Tom managed to avoid the carnage and was now in P11 and chasing down Tom Chilton in his RML Chevrolet. This was yet another great performance but the Chevrolet was too far ahead and Tom took the chequered flag in P11 with another 3rd Independent spot. This was the teams most successful weekend of the 2013 championship and shows the potential with no bad luck striking. 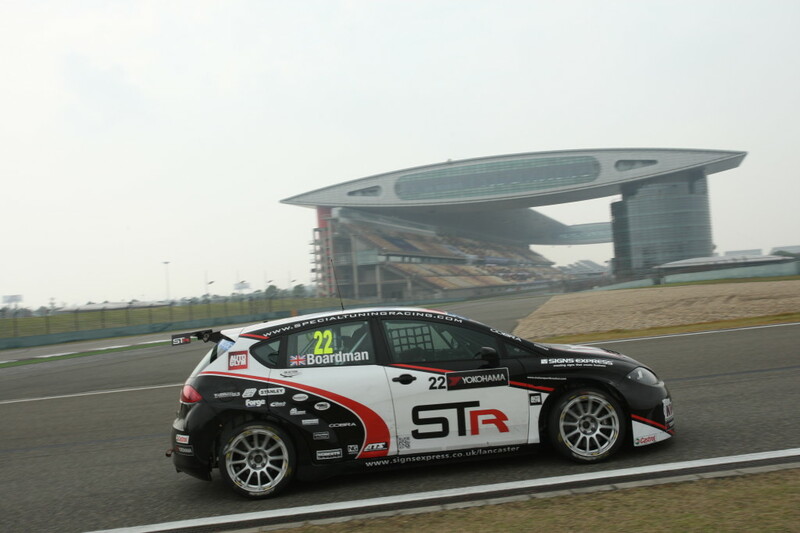 The team will be looking for a repeat performance in two weeks time at the final round of the championship in Macau.